You may be looking for an easy recipe for an easy apple crisp recipe. This is a wonderful dessert you can make, and nothing beats the smell of a fresh apple crisp baking in your oven. You may be looking for an easy recipe for homemade apple crisp. 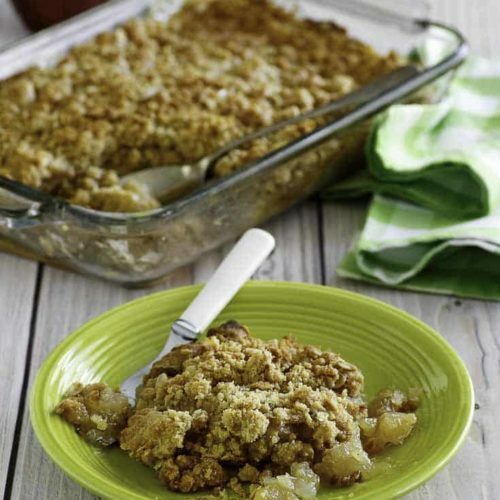 This is a wonderful dessert you can make, and nothing beats the smell of a fresh apple crisp baking in your oven and whetting your tastebuds. When I was a small child growing up in Pueblo, Colorado, my family had several apple trees in our backyard. When the right time came during the late summer and early fall, we were busy picking apples and preserving them. Sometimes we were lucky, and my mom would put together an apple crisp for dessert. We always made fried apples, but an apple crisp was a special treat. 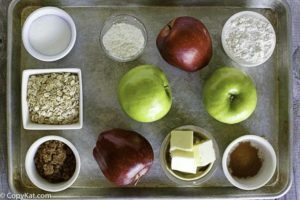 What’s in My Apple Crisp recipe? This is an old fashioned apple crisp. We are going to make a butter topping using rolled oats – the kind you would use to make a breakfast cereal out of. I like to use baking apples for this recipe, as they tend to hold up to the heat well. The filling is made with apples, sugar, a bit of cornstarch, vanilla, and a squeeze of fresh lemon juice. And ta-da! 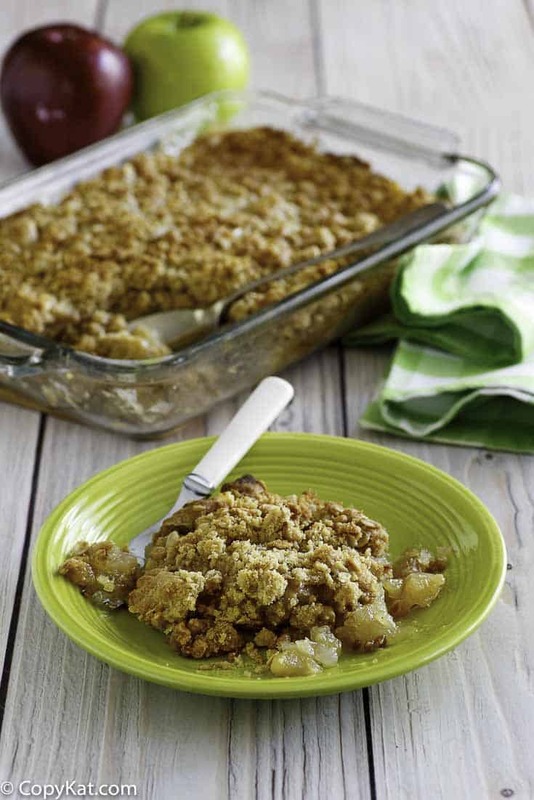 – a delicious apple crisp that your family will fall in love with. I like to serve mine up with either some whipped cream or a scoop of vanilla ice cream. However, it’s even good just plain and hot straight out of the oven. For this recipe, I like to use two different types of apples. For me, the Granny Smith is a nice tart apple that bakes up very well. I may combine the Granny Smiths with Braeburn, McIntosh, or even Red Delicious apples. Often for me, it’s what is on sale when it comes to red apples that helps make that choice for me. You just want to make sure that you are using an apple that will bake up well. I like using several types of apples because you get the best flavor this way. I always like to layer flavors. Apples are a natural pick for baking with spices like cinnamon. Read about twelve different varieties of apples that are good for baking. Making a Homemade Apple Crisp is easy. Preparing a homemade apple crisp is actually pretty easy. So if you don’t think you’re very good at baking, this may be a great recipe for you to try. If you can measure accurately and follow directions, even a beginner cook can have great success with this recipe. Enjoy! 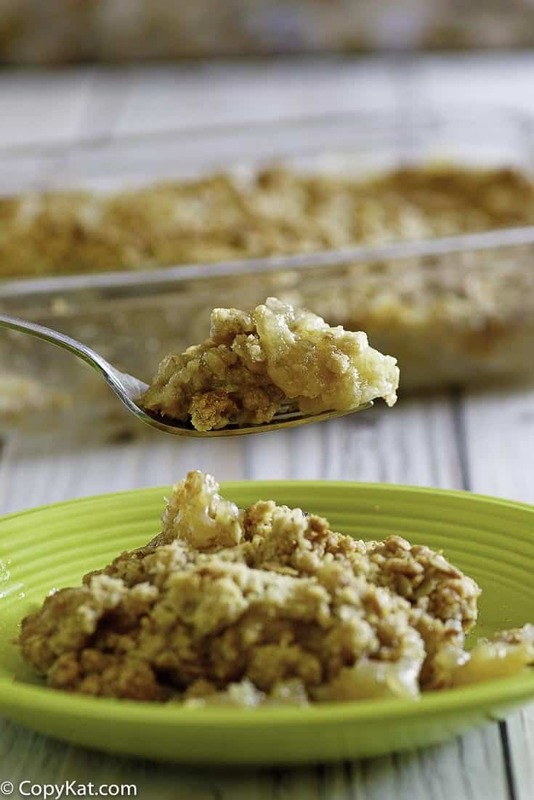 This is a super easy recipe for homemade apple crisp. In a medium sized bowl combine 1 cup flour, 1 cup brown sugar, rolled oats, 1/2 cup cold butter, and 1 teaspoon cinnamon. With a fork combine the mixture until it becomes uniform and crumbly. Add peeled, cored, and chopped apples to the pot and mix well. In a small dish combine 2 tablespoons water and 2 tablespoons cornstarch. Stir cornstarch until smooth add to the pot with the apples. When the mixture thickens remove from heat. Pour apples into a 9 x 14-inch oval baking dish. Top with crumb topping. Bake for approximately 1 hour or until the topping browns. In a large pot over medium heat combine 1 cup water, 1 cup sugar, vanilla, lemon juice, and stir to combine. When the mixture thickens remove from heat. Pour apples into a 9 x 14-inch oval baking dish. Sprinkle the topping over the apple mixture. Bake for approximately 1 hour or until the topping turns golden brown. Serve with some vanilla ice cream. WOW, what an awesome recipe for apple crisp.Thank you so much for sharing,i have seen a few things on your site that i just love so i know i will be speaking with you again soon.Have a blessed day. We love Apple Crisp! this sounds delicious! Thank you! I hope you enjoy this one.